Once the circumference line of countervallation had been dug, the next stage was to dig toward the fort. These trenches going toward the fort were called saps and those who dug them were sappers (sometimes also called pioneers). The saps (or most any trenching) when completed were often deep enough to allow a man to stand upright and wide enough for two soldiers to pass each other without having to say 'excuse me.' The trenching itself did not have to be six feet deep, instead, merely half that. With dirt being shoveled out, that same dirt could be dumped into standing gabions that were at the edge of the trenching and on the fort side. Once the gabions were filled, fascines were placed atop them and any additional dirt was dropped onto the other side of the line of gabions. Note how the sap splits and becomes maze-like near the fort. John Muller* recommended eight men work at a time at the head of a trench: four to dig and four to pass them whatever was needed such as water or a new gabion shell. After the four diggers became tired, they were relieved by the four providing support. The frontmost digger would go down about 18 inches, the next man, six inches, and so on in a stepwise fashion until the three-foot (or one meter) depth was reached. And step by step the trench was widened, too. Engineers of a time earlier than Muller may not have been so methodical. They simply had diggers positioned about three to four men for every four meters of ground to be trenched. Each man dug down as much as a meter, with his work connecting with that of others to make a trench. What they dug out and the gabions they filled provided the sappers' only protection. In front, a large gabion was set on its side with the ends capped, and rolled ahead of the digging (a thick gabion full of dirt must have been tough to push). Sometimes a wheeled device called a "mantelet" was sometimes used in place of the rolled gabion; de Monluc mentions use of such (with a thick wood front) in the mid 16th century, and in the late 17th century mantelets had an iron plate in front. As an additional precaution, saps were rarely dug directly toward the fort. Any trench made like that would have presented a straight slot for the besieged to shoot along. Instead, saps were constructed at angles to the defenses and the result when viewed from above made a zigzag from the countervallation in the general direction of the fort. As early as 1498 besiegers took this precaution; Philip of Cleves wrote then: "You have to watch out for the towers, bulwarks and batteries of the town, and you must direct your trenches in such a way that none of the guns can get at you inside." Only a quarter of the perimeter is shown. Artillery batteries are displayed and will be discussed right after the page on "Little War." 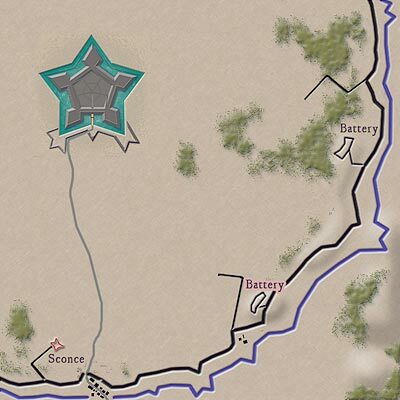 Following completion of the circumvallation, besiegers set up their first artillery batteries close to the perimeter. These batteries began the pounding of the fort, concentrating on knocking out the defenders' cannons (as best as possible considering the distance and the aerodynamics of spheres propelled through smoothbore barrels). As soon as the batteries began their work of attrition, sappers began digging trenches zigzagging toward the defenses. Often digging without pause, teams of sappers made their way closer and closer to the defenses, maintaining their zigzag courses. Redoubts were set up to protect besiegers as they lay in wait for attacks from the defenders (and a refuge for sappers to scurry to when attacked). The redoubts were dug-in positions with gabions and the like, in a way like sconces, except connected to the trenching. As the trenching advanced (and presumably the defenders' cannons smashed into silence one by one), additional batteries were established closer to the defenses. Click to see the advanced trenches and redoubts. Double click the link to return to the early version. Saps were the defenders' big concern. They did what they could to stop or even slow the digging, and at the same time make the digging as costly as possible in terms of enemy casualties. Recall the discussion on dynamic defense? Much of that effort was directed against sappers and their work. Sniper and cannon fire picked at the saps in the day when they could be seen. When night hid the trenching, that same night also concealed the besieged launching anything from reconnoitering to a counterattack in force; favored times for a counterattack were mealtimes, changing of the guard and just before dawn when even the most faithful sentry could be nodding. Maurits van Nassau promised Dutch diggers as much as 20 times the normal rate to face the risks of sapping. Muller mentioned: "...if there are any kill'd, the survivors of the Brigade receive their pay; by which means it has sometimes happened that one or two men have received the pay of 24..."
In the night sappers and defenders sometimes fought furiously; it was war between the few and close enough for hand to hand.